Food allergy is an adverse systemic immune response against food. With the continuous progress of social progress and globalization, the incidence of allergic diseases has been escalating. About 30–40% of people in the world suffer from various allergic diseases, and morbidity and mortality show rising trend year by year. Unfortunately, there are no effective methods to prevent and eradicate food allergy nowadays. So the only safe and effective way available nowadays is to avoid eating or contacting with allergens. Therefore, eliminating food allergens by food processing methods is an effective way. Although most allergens and antigenic determinants can tolerate various forms of food processing methods to a certain extent, many researches have shown that particular food processing can still affect the allergenicity. In the field of food processing, physical, chemical, enzymatic, and fermentation methods can modify the activity of allergens. Protein is one of the main components of food, and it is also an important nutrient as well as the predominant allergen category in people’s diet. Food processing methods can cause the change of spatial structure and physicochemical properties of protein macromolecules and therefore destroy the allergenic epitopes of protein. 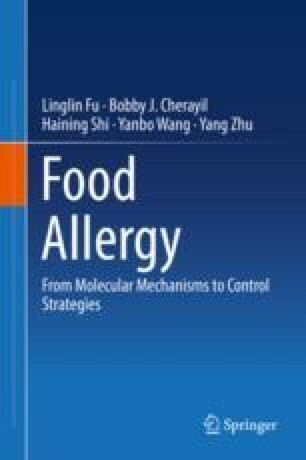 This chapter will introduce the common and advanced application of physical, chemical, and biological approaches in the elimination of allergens in food.